Our Design Director has more than 30 years Computer Aided Design (CAD) experience, which includes positions held as CAD Manager in three different companies during his engineering career, one of which was at Fisher & Paykel Industries. Fisher & Paykel Industries, headquartered in Auckland, was New Zealand’s largest manufacturer at the time with complicated design system demands. This experience has been invaluable when dealing with the various design and data filing systems that we have come across in our more than 15 years of contract CAD, Computer Aided Engineering (CAE) & Product Data Management (PDM) consulting services. One trap that we have seen companies full into is losing sight of the KISS principle, as in the Keep It Simple Stupid principle. CAD CAE & PDM systems have become more and more complicated over the years, and sometimes not always for the better. Knowing how to manage this additional complexity is crucial to the successful implementation of any system and this is where Design Smart can make the difference to your company if so required. 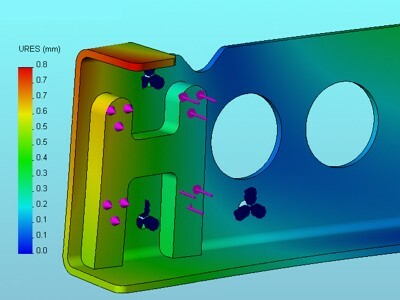 We also provide non-linear static Finite Element Analysis (FEA) in house and sub-contract more specific / advanced analysis if and when required including CFD. We can photorealistic render or animate your designs as required and also organise for either a 3D Print or rapid prototype machined from solid for quick hands on evaluation of your design. Examples of our Consulting / Engineering Support Services work undertaken are as documented in the side links. Please contact us to discuss your CAD, CAE and PDM requirements.